Bida Nai of Phi Phi Island is the smaller sister of the two Bida Islands the other being Bida Nok. Choosing which is the best dive out of these two is difficult and to be fair, must really go down on a day by day basis. One day it’s Bida Nok with all the action, the next, it is Bida Nai, either way, they are both fantastic sites and well worth the venture out here. There is a small bay; this is the main drop point for divers as the divers drop down, they are two different directions in which to go. Turn south, travel over the sandy areas and you will come to fantasy reef, before you arrive at this amazing reef you will have already encountered some Moray Eels, Lion Fish and loads of Wrasses and Parrotfish maybe even some Blue spotted Stingrays thrown in for good measure. Fantasy reef, sits at 18 meters then drops down to 27 meters depending on the tides, the visibility can sometimes drop down to 10 meters, maybe less, depending on the conditions. There are quite a few large boulders making up this lovely little reef, and in between each boulder you will find huge Gorgonian Sea Fans and Whip Corals great area for macro. 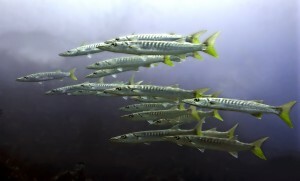 Look above and you will see circling a large school of Pickhandle Barracuda. Best to keep your eyes on this lot, they are very excitable and any fish that may stray into their area are in for trouble, just watch them move and in the blink of an eye they are gone. 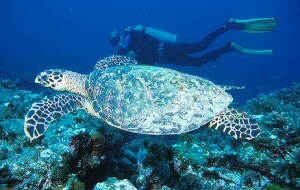 Heading back towards the main part of the reef, take a look out for some sweet little swim throughs. There are so many fish here you may get disorientated by the sheer number, this area teems with life. 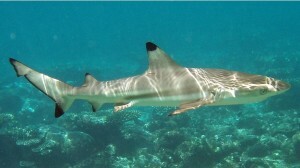 Look for Black Tips as they tend to like this area too, be quick though. If you choose to do the opposite side, the north side of the island, even more fun and games await you. There is a spectacular wall here and just cruising around here you will spot some serious action. Trevallies, Emperors, Tunas and mackerels all hunt around here, there is also a shallow cavern to explore. Huge Barrel Sponges are very interesting, sometimes you can find a Scorpion Fish inside one, as they like to wait in there for a meal away from the crowds, so be careful not to stick your hand in. The sponges are actually animals, they are filter feeders and filter many hundreds of litres of water a day. 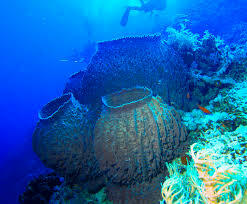 They are also some of the oldest living creatures on the planet, some of these sponges have been dated to over 2000 yrs. Old. 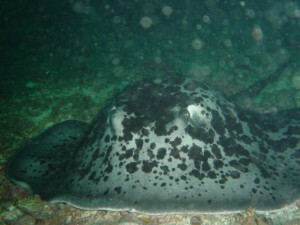 Quick reminder of what fishes you can see here on Bida Nai, Leopard and Nurse Sharks possible Black Tips too. 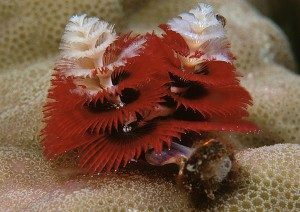 Several species of Barracuda and Trevally, Loads of Soft and hard corals, Scorpion Fishes a plenty, beautiful Angel fish and Trigger fish live here. Nemo and his friends also lives here with many diferent wrasses and parrotfishes, Stingrays, and of course if you are really lucky Manta Ray’s and Whalesharks are seen here few times a year.